A night of glitzy gold, styled by Cyd, editor of one of my favorite party sites The Sweetest Occasion. I had a chance to spend time with Cyd in Utah last month and just adored her passion for blogging and her drive as a stylist, you can check out her fabulous portfolio here. 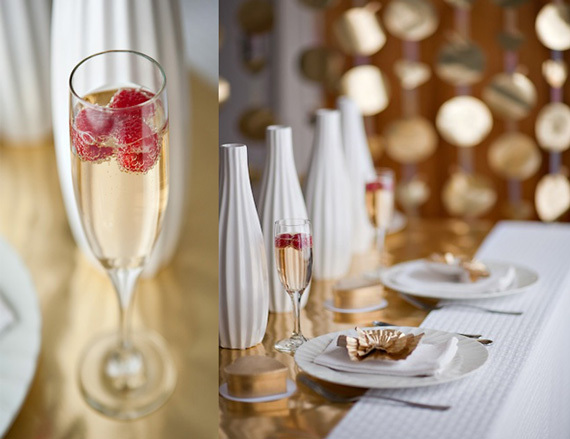 A night of glitzy gold, a sleek party scene that would be perfect for Valentine’s day, an anniversary dinner, or as fresh look for a sweetheart table. There is so much beautiful interest in Cyd’s design. 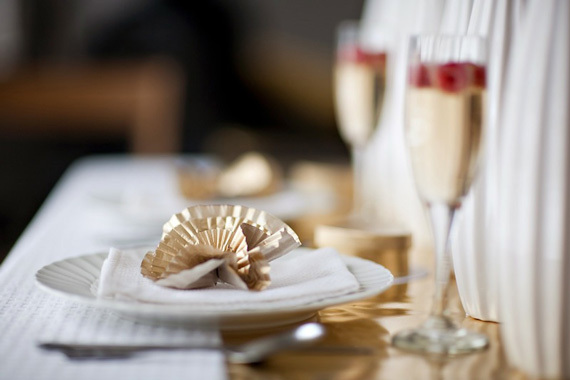 She mixed the reflectivity of the gold paper with simple textural white linens, sculptural white vases and simple white tableware creating a gorgeous party look. Isn’t that cake fun!?! I just adore how the simple, handmade details stand out against this design contrast to make a table fresh and modern. 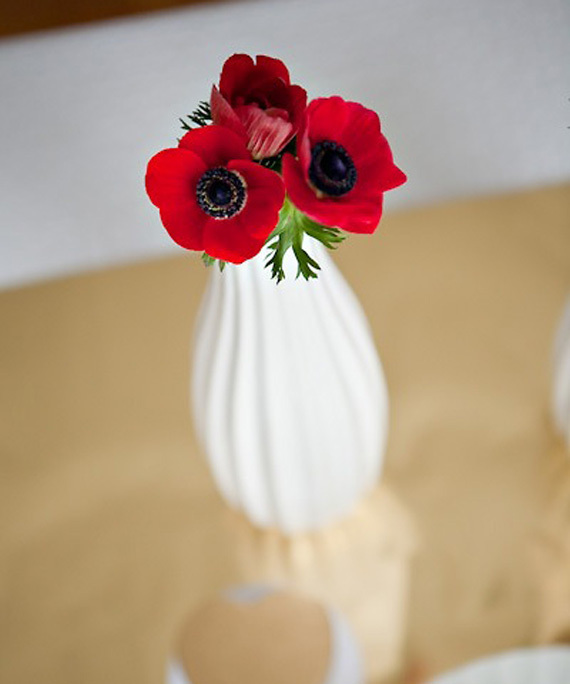 White and gold take center stage, with bright pops of color from vibrant red anemones and a few raspberries tossed in with the champagne. The overall look is sleek, modern and a touch glitzy without a lot of fuss. 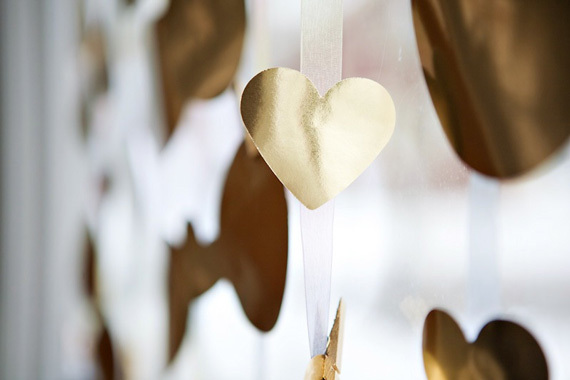 A pretty gold paper wall instillation served as the backdrop for this glamorous affair. An easy project to create by cutting and hanging wrapping paper in vertical rows from above. 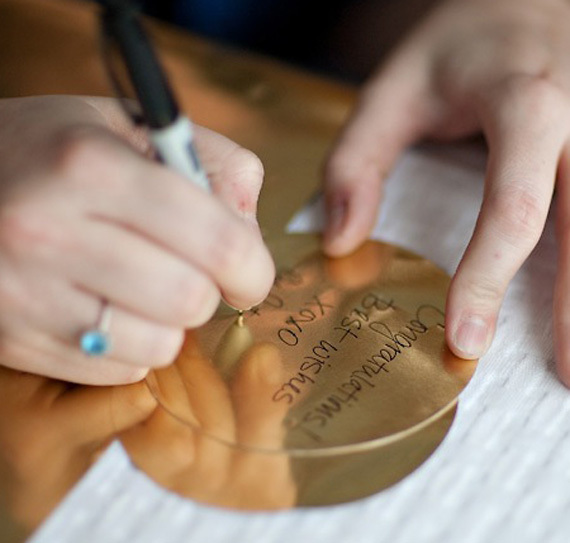 When a few extra pieces are left lying about, it instantly makes a sweet way for your guests to write a few congratulatory notes of love. 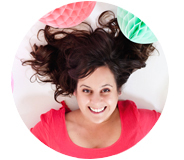 Check back later today for Cyd’s DIY project to create cupcake liner flowers. Plus you have 48 hours to add a comment if you’d like this celebration design to win! love it all. cute cake topper! love the gold and white – so clean and refreshing! i love the use of the cupcake holders as decor. the gold and white is such a clean pallet that looks elegant but not too fussy — as in i could easily do this in my home and have it not look out of place. great photos, thanks for sharing!! In LOVE with all the gold! The table is clean and fun, but not fussy – just my style:). 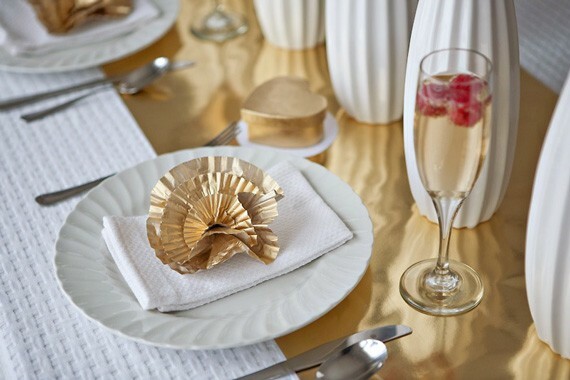 love the golden cupcake liner cake-topper/plate decorations. I’ll def be back to check out the tutorial. Beautiful!!! I cannot wait to see how to make those gorgeous flowers! What a gorgeous party! The cupcake liners really are ingenious-they look so chic! So beautiful, fresh and clean. Wonderfully different from all rustic events that are everywhere! I love this!!!! 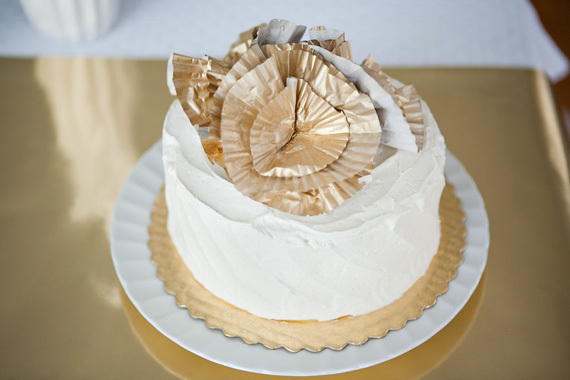 The gold dots and those pretty little liner flowers on the cake! Eek! Gorgeous! I love the simple, yet elegant style. Ooh Gorgeous. Love it all… so fresh and clean and elegant. Love Cyd and love her work!! Very sophisticated and glamourous! Especially like the golden paper garlands and the cupcakey flowers, just gorgeous! Glamorous and sophisticated, clean and fresh, a very apt description. Exquisite! Clean, classy, but fun!! I love it! Absolutely gorgeous!! This one get my vote! So elegant and clean feeling, I love it all! Fantastic & i’m not even a fan of gold! I love all things shiny and gold. The curtain of hearts seals the deal.